At the entrance to the Khumbu valley, in the foothills of the Himalayas, lies the town of Lukla. As the trailhead for all treks and expeditions to Mt. Everest and the other Himalayan giants, Lukla is the starting point for every climber and trekker. However those who dare to climb to Everest’s summit must first pass through a nightmare scenerio – landing at Lukla’s infamous airport standing precociously on the edge of a 2,000 foot (610 m) cliff. There are no turnarounds and no second chances here, using rickety old planes, sometimes literally held together with duct tape, pilots have once chance to execute a perfect landing or risk slamming into the wall on the wall on the far side. 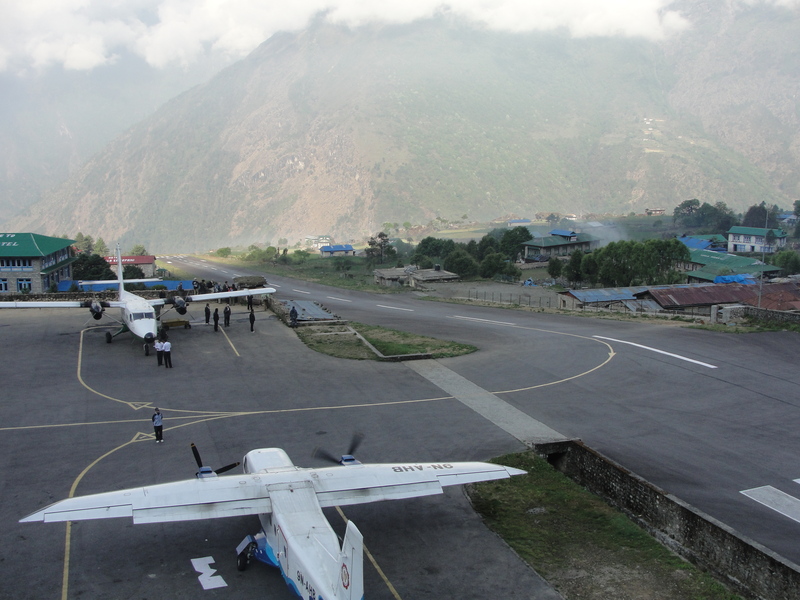 In 2010, as I headed for Everest Base Camp, I experienced, and survived, what is the world’s scariest airport. As I walked out onto the tarmac and took a look at the plane that was taking us to Everest, it was hard not to have my stomach in knots before we had left the ground. This Twin Otter, chosen for it’s Short Take Off and Landing capabilities, looked like it had been through all sorts of hell. As I stepped towards the stairs to board, I noticed the stewardess kicking the slightly jammed door down towards the tarmac. Entering the plane, I quickly took my seat. The claustrophobic interior consisted of a two small rows of seats on either side. My traveling companions were a middle aged Dutch man, his guide, and Ram Krishna, my guide. I took a whiff of the dank odor, and tried get comfortable on the ripped fabric of the seats. 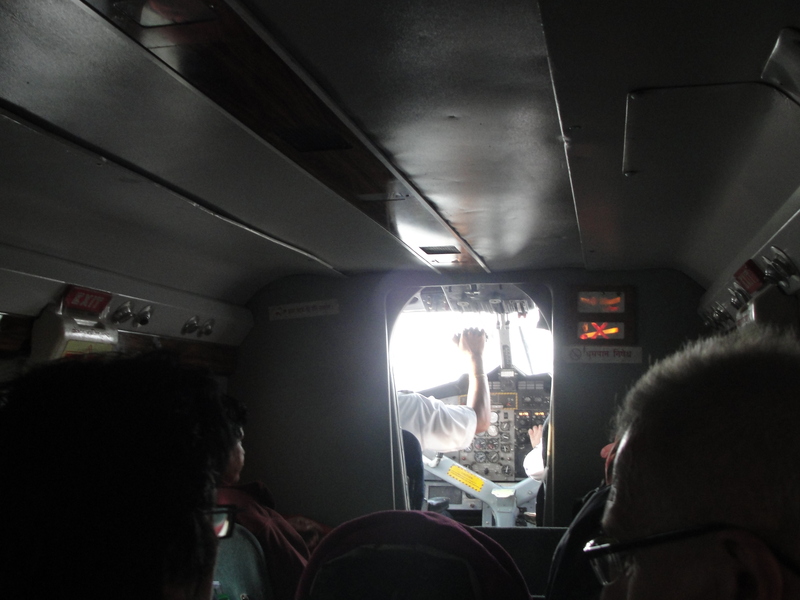 Looking out the window at the sub-tropical Kathmandu valley, I imagined how many expeditions and how much equipment must have passed through this plane. There was no division between us and the pilots and we could see all their work. 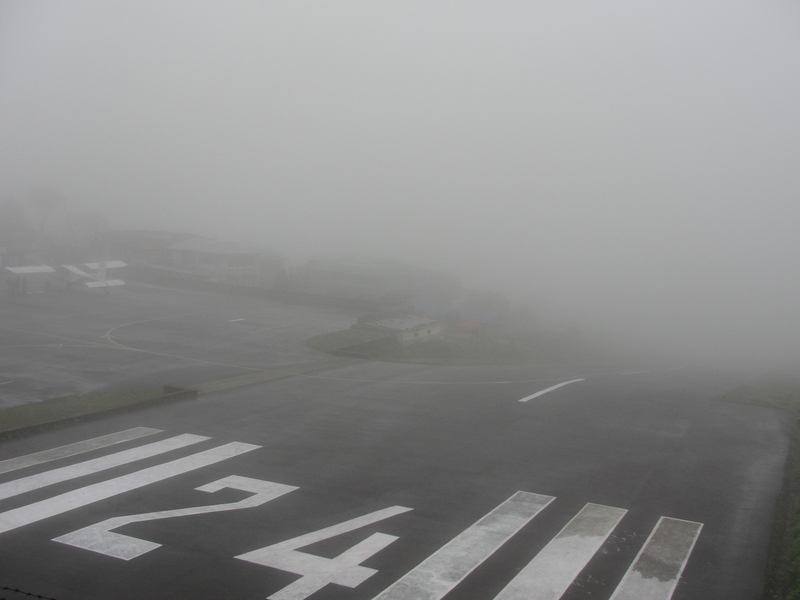 To fly to Lukla, Nepali pilots must be specially trained and certified. The airport, which was constructed partly with the support of Sir Edmund Hillary, consists of a single runway which runs uphill at a gradient of 12%. Sitting at an elevation of 9,100 ft, take off and landings can only be accomplished in perfect weather, and it’s not uncommon that trekkers can be stranded for days without a flight back to Kathmandu due to the thick mountain fog that routinely rolls in. The construction of the airport is grounds for legend itself. Hillary recounts that Sherpa workers and merchants, devoid of any modern equipment, line danced across the runway to crush the stones. When they came upon a large boulder, they would simply dig a hole and roll it in before covering it up. For years, the runway was a single dirt strip, and was only converted to concrete in the late 1990’s. 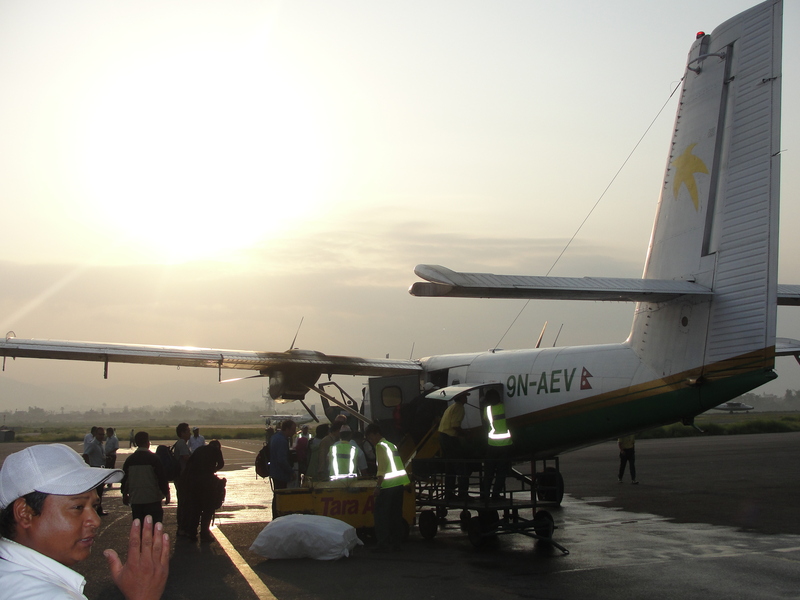 Our Twin Otter lifted off from the concrete jungle that was Kathmandu and veered north towards the mountains. In mere minutes we were dancing around the foothills, with clouds rolling in on either side of the plane. I clung tight to my armrest and dared to look out the window. Turning my head nervously, I felt the plane shake quite hard as we skimmed above the tree line off the sides of cliffs. We were so close to the side I could make out individual homes and farms as we jolted around one mountain to the next in a high speed game of chicken. Coming into a clearing, we had a brief respite from the onslaught of nerves that was rocketing through the plane. As the clouds cleared, I could make out the majestic snow capped Himalayas in the distance, offering a moment of peace and wonder that however wouldn’t last long. About twenty minutes in the flight, we started to make our descent. Climbing around the various peaks, I could hear the engines straining to keep up with the sudden altitude changes. We caught a draft on my side of the plane that rocketed my head towards the aisle. Picking myself up, I took a look forward towards the cockpit and could faintly make out the runway far out in the distance, but I couldn’t understand why we were so high, and the runway seemed far to low to be making a normal approach. I was never expecting what happened next. The pilots, having cleared the final peak, pitched the nose of the plane so far down I was pushed face first into the seat in front of me. The plane went into a perpetual nose dive and my hands dug so far into the plastic arm rest I felt like I could pull it out. With my heart beating and my palms sweating, I listened to the engines roaring as the altitude quickly decreased. In a moment where seconds seemed like hours, the plane slowly began to lift and when I had the courage to look up we were on par with the runway. Soaring low over the rocky outcropping before the edge of the strip, the pilots masterfully touched down just before the incline. Because of the angle, the plane has to taxi to it’s parking spot at full throttle. With the plane making it’s way uphill, I sat back to catch my breath and slow down my heart while the pilots made a sharp right turn at the very last moment before the wall, adjusting the plane into its bay, and stopping the engines. I had just survived the nightmare of all landings. Entering the miniscule terminal, I was hounded by local men, all begging to be porters and guides. Having already hired one, I walked past them and made my way into the town. 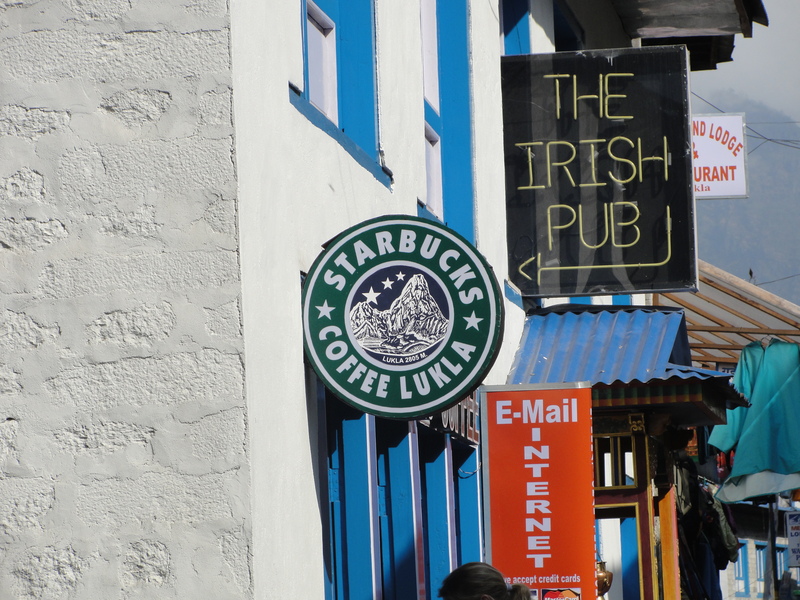 A knockoff Starbucks, with surprisingly more variety than the real thing. Yak trains and herders run wildly through the narrow cobblestone streets while you’re likely to hear every possible worldwide accent in the matter of a few minutes. 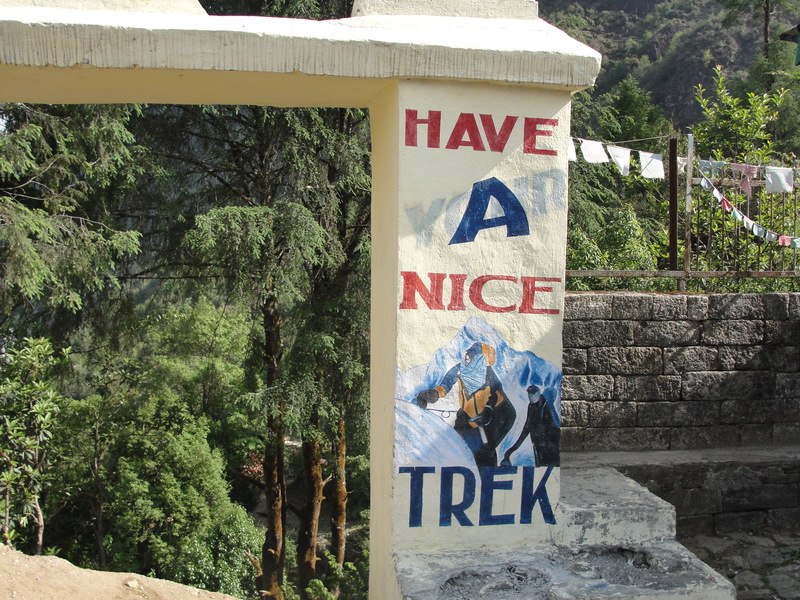 After a hearty breakfast at one of the lodges, my guide and I made our way to the far side of town, where a Tibetan style shrine, dedicated to the first woman to climb Everest, welcomes trekkers officially into the Khumbu Valley. As I passed through the arch, I spun the prayer wheels for good fortune on our trek. 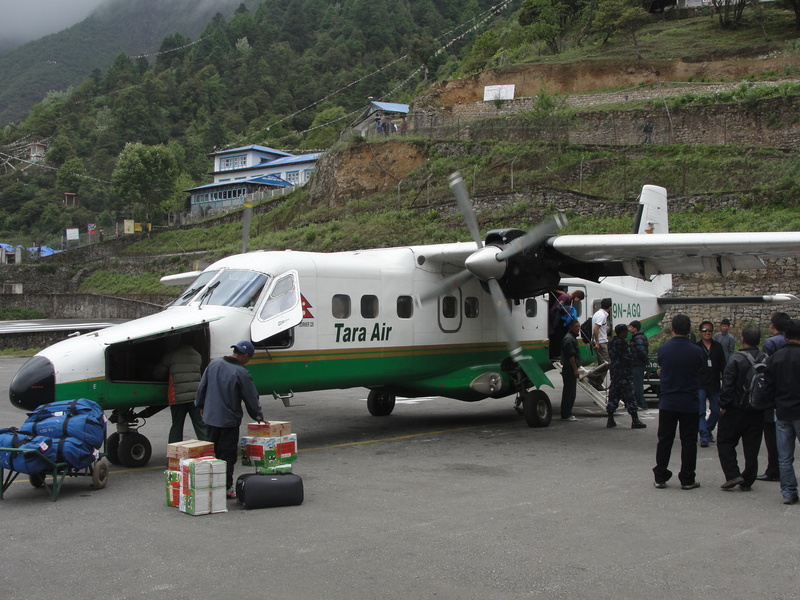 Ten days later, having successfully reached Base Camp, I was back in Lukla for our flight home. 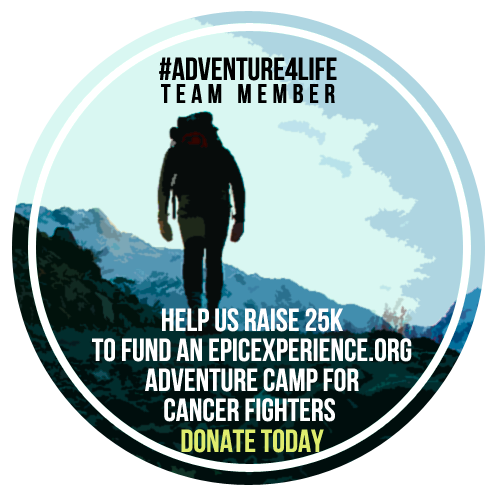 Unfortunately the weather was not kind to us and we ended up stranded for three days, accepting donations of apple pie and hot chocolate while chatting with trekkers and climbers alike over cups of mint tea at “Starbucks”. On day three, we received a welcome break in the clouds and eagerly waited the sounds of engines in the early morning haze. Our plane finally landed at about two in the afternoon and thirty minutes later we were good to go. The Twin Otter rolled to it’s spot at the north end of the runway and spun facing the downward incline. With the parking brakes on, the pilots throttled to full power and waited to reach their max airspeed. With the right speed, the pilots released the brakes and our aircraft barreled down the runway. While most planes slowly lift off the runway, ours simply ran off it, and in no less than three seconds, we were 2,000 feet in the air and making our way back towards Kathmandu. While flying is not the only way to reach Lukla (the other consists of an equally scary bus ride to Jiri, followed by a weeklong uphill hike to the Lukla trailhead) it is the most direct route. Surprisingly, Lukla holds a descent safety record despite several accidents. Conditions here are tightly monitored and they won’t let planes fly without the ideal climate. The flight to Lukla is harrowing, but for those who are willing to put their nerves behind them, it offers a spectacular one of a kind view, a great story, and the beginning of a grander adventure.